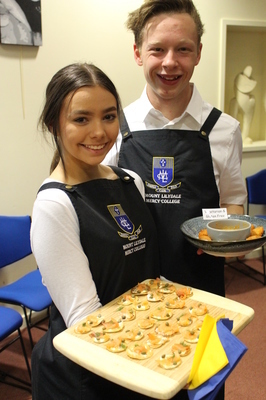 Hospitality students Emma Keithley and Tom Parrot at the launch. Mount Lilydale Mercy College students have launched their 2017 vintage. 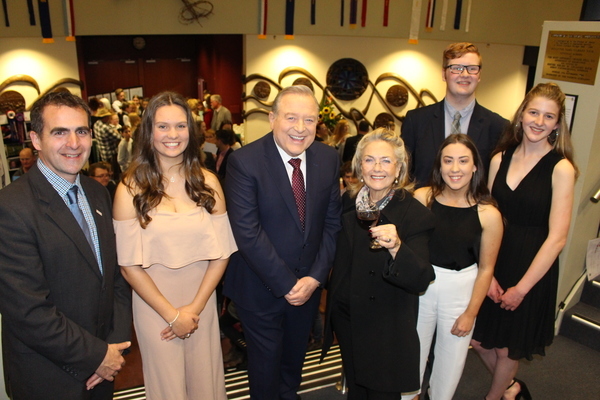 The secondary students produced the cabernet sauvignon reserve and unveiled the drop in the school’s Centennial Hall on Friday 7 September. 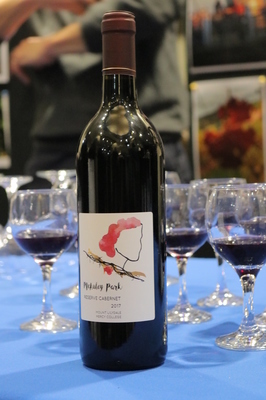 The McAuley Park cabernet sauvignon has a reserve title for the first time. Reserve wines are typically held back from general market release or given a higher price due to exception quality, considered better than the average vintage. The 40 students who created the wine took part in the launch, and other students provided the food, hospitality and entertainment. Students manage the vine canopy and check for pests, take yield estimates, monitor sugar, flavour and acid levels, harvest through the school holidays, bottle the wine and design the wine labels. The vineyard has been at the school for about 20 years, but this is the fourth year of the student-created wine program and the fourth vintage produced. The 226 plants on about half an acre in the school grounds yield about 300 bottles annually. Yering Station supports the project by supplying wine analysis and barrels. Its chief winemaker, Willy Lunn, hosts tours of Yering Station to link the students’ classroom learning about biosecurity and the full winemaking process. The partnership has allowed students like Abigail Van Bergeijk to explore future careers while completing school. She’s in Year 11 and works in Yering Station’s cellar. 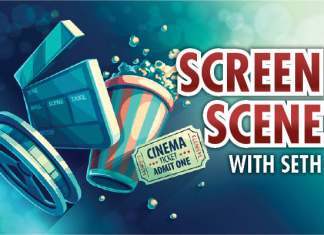 “Motivated young people add energy to the industry,” Mr Lunn said. Ivy Ferguson-Mayer is another Year 11 student taking part in the program who has industry connections. Her parents operate Bloody Hill Wines in Healesville and her father, Timo Mayer, was once a winemaker for De Bortoli and Gembrook Hill. Ivy said she aspired to use what she’d learnt at the school farm, McAuley Park, beyond the college, and enjoyed the teamwork. “Everyone gets excited and we are never short of a helping hand,” she said. Mount Lilydale’s wine won a bronze medal for its 2016 vintage at the Victorian Wine Show, up against more than 80 wineries. It also won bronze at the Eltham wine show, the largest amateur wine show in Victoria.